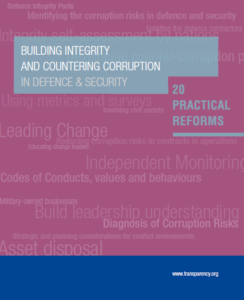 This Handbook has a simple purpose: to show busy decision makers how significant progress can be made in tackling corruption risks in defence and security. In it, Transparency International recommends ways to diagnose corruption risks and how to lead change in defence and security establishments. Areas discussed are military operations, the procurement process, and budgets and assets, and show how nations are tackling corruption risks in each of these. The defence sector faces unique risks to corruption due to high-value contracts, requests for official secrecy, and close government interaction on the buyer and seller side. This Transparency International report presents examples of good practice by defence companies. 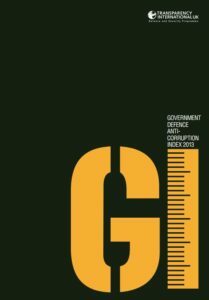 This Government Defence Anti-Corruption Index is the first ever review of corruption risk and corruption vulnerability in Defence Ministries and Armed Forces. 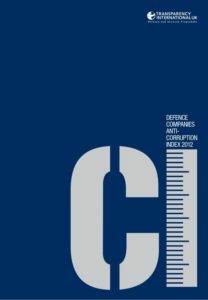 It offers governments, armed forces, civil society organisations, and citizens detailed knowledge and understanding of the corruption risks in their national defence and security establishments. Armed with this knowledge they can press for change and improvement. 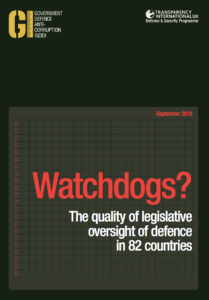 This report looks into what defence companies currently do and fail to do to prevent corruption. The purpose is to assist in raising anti-corruption standards across a major sector that is global in nature yet whose business has historically been hidden from public view. The 129 companies analysed in this study are those with the greatest defence revenue from the six largest arms exporting nations, plus the largest defence companies from a further twenty-five countries. Together, these companies account for over USD 500 billion of global defence revenue, and USD 11 trillion of total revenue. 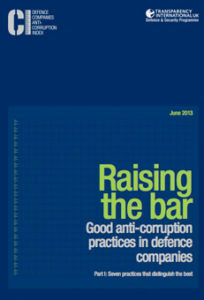 Parliaments and legislatures play a key role in the battle to prevent the risk of corruption. They can do this by legislating for laws to prevent it, putting issues of corruption in defence at the level of national debate, and exercising powers of oversight. This report — the first one to take an in-depth look at the results of the Government Index — examines how effectively they do this. It aims to better understand the strengths and weaknesses of legislative institutions in controlling corruption in the defence and security sector, and to provide clear guidelines on how parliaments and legislatures can do better.